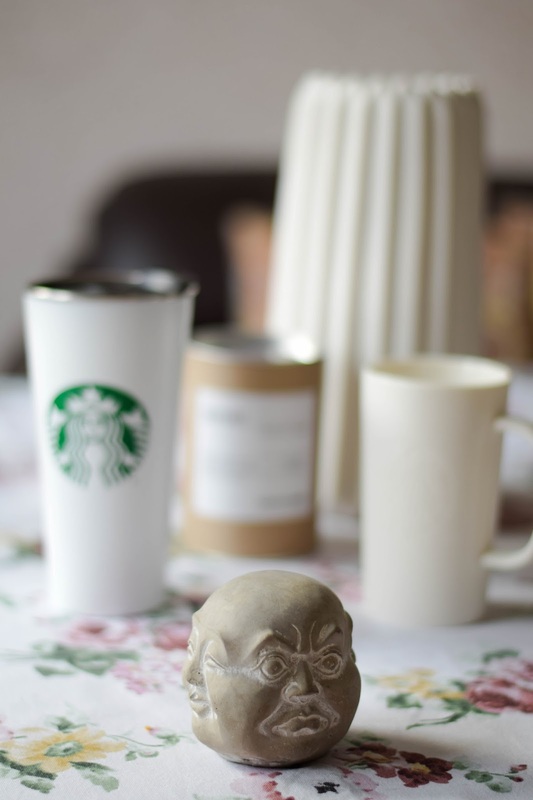 Okay, I must admit I`m kinda a homeware addict. I love all the little bits and bobs that make our home beautiful and special. Love those decor pieces more than anything and believe me, if I get the chance of homeware shopping I can go pretty much outa control. The only thing that was holding me was the plane baggage limit, but I still somehow managed to buy (and successfully bring home) a massive and pretty heavy vase (yea, that`s what kind of obsession I`m talking about). So the first and the most exciting thing for me (or maybe not... hmmm, they`re all so lovely and I`m excited bout all of them. lol.) is this amazing candle. To make it clear - I LOVE CANDLES. Like seriously, it`s a major obsession and I`m not complaining about that. Whenever I go to a shop and spot some candles I just have to smell every single one. It`s a must. So it would be a shame not to bring an amazing scented and so aesthetically pleasing one from a trip. 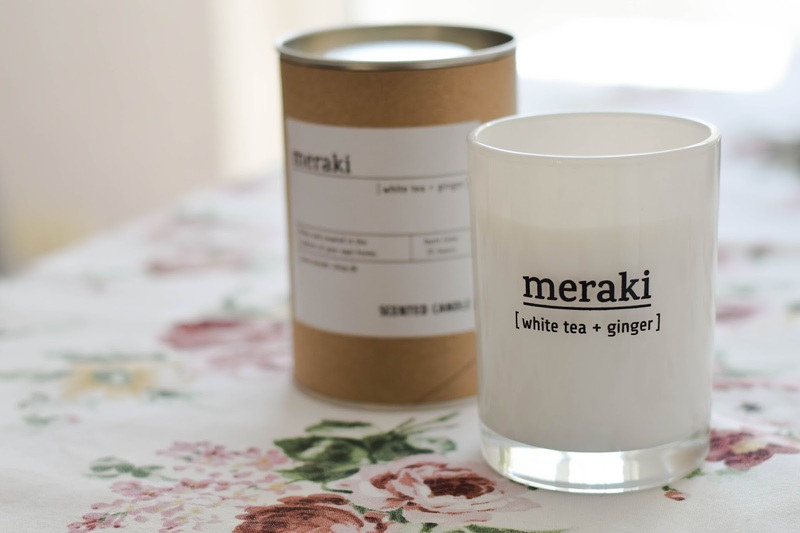 It`s by a brand called Meraki and the scent I went to is white tea + ginger and oooh my gosh... it`s so light, fresh and clean, kinda bright (if you can describe a scent like that) - absolutely perfect for spring! The next thing is one I literally love. Like this is my fave thing I yet will have in my room. This little head (I call it a Buddha head, don`t ask... it`s just cuz the top of it is so soo smooth like one of those Buddha's bellies you have to rub for luck or a wish) is sooo damn cute. At every side, it has a different emotion and I love every single expression because life is all about it, we can`t be happy, or especially sad all the time, yea? So here`s the big one - the vase. What can I say... I just couldn`t leave this gorgeous there. It`s so cool and it`ll match my new room perfectly (spoilers // perhaps a room tour will be coming up). 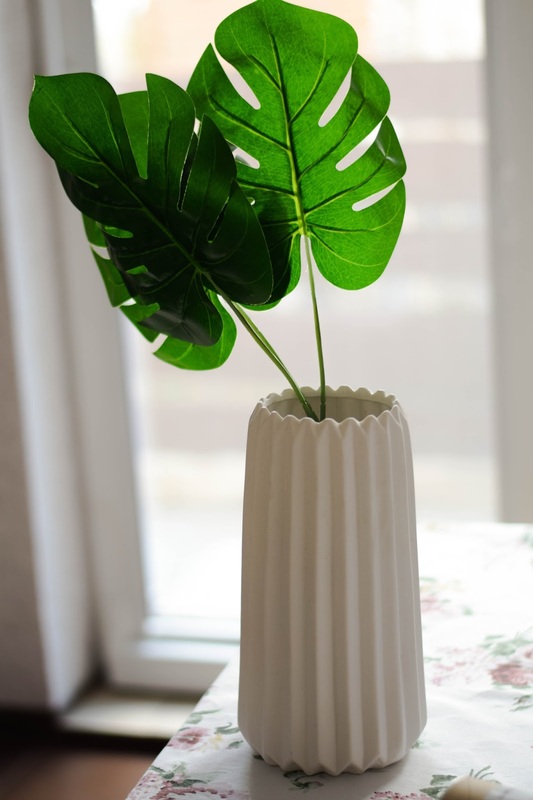 And to go with it I bought a few of these fake monstera leaves, cuz you can never go wrong with a few bits of green that you won`t kill. 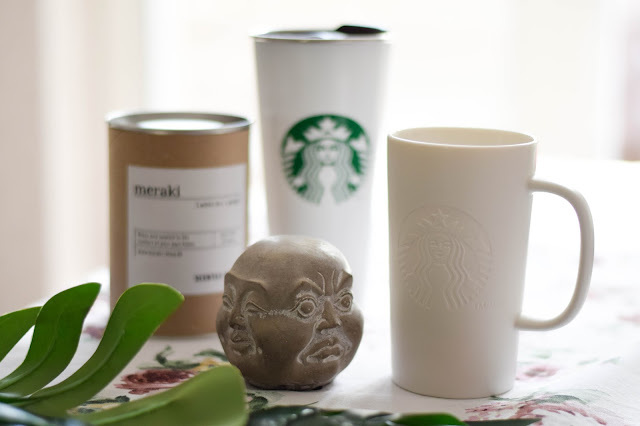 And the few last, but, of course, not least bits are from one of my fave places from the whole trip - Starbucks. 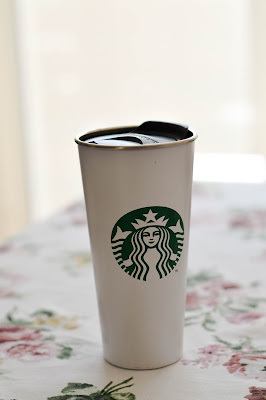 Yea, I`ve talked about this in my trip post, but Starbucks was always something special to me and bringing home something from there is so amazing. 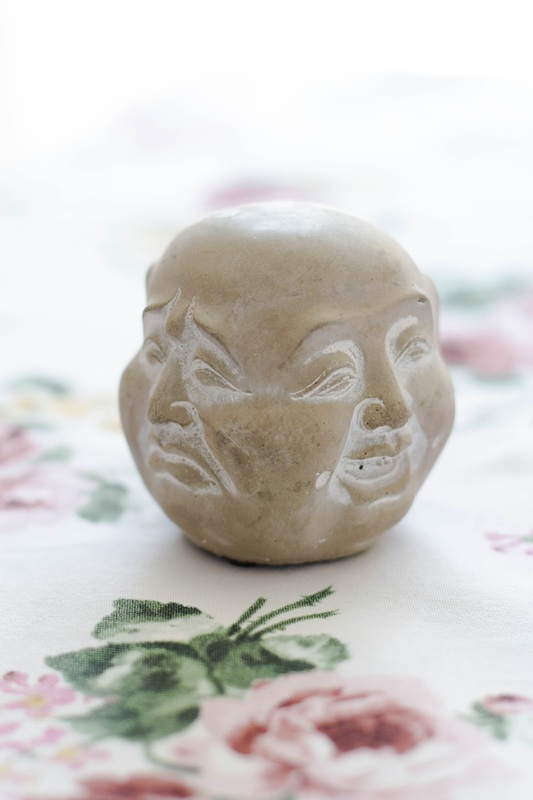 The first one is this stunning ceramic one. 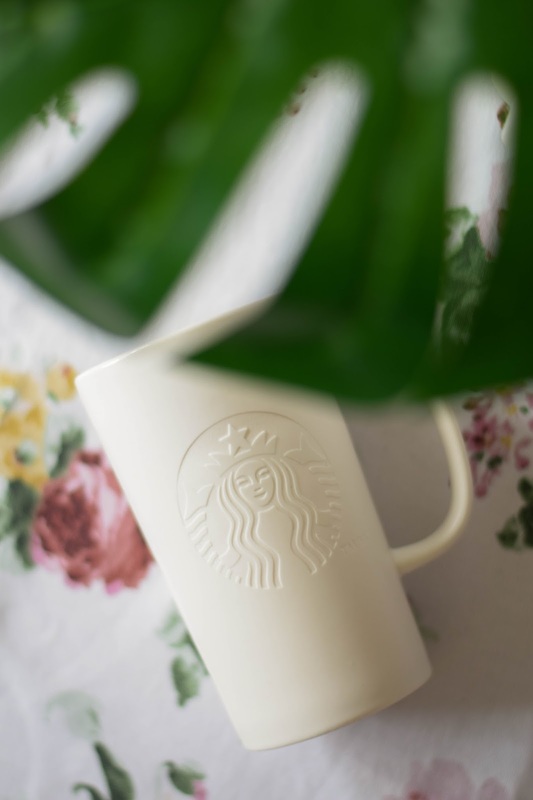 It`s so minimal and simple, but that`s why I love it (you may have noticed that everything is quite simple, cuz that`s what I`m like when it comes to homeware). 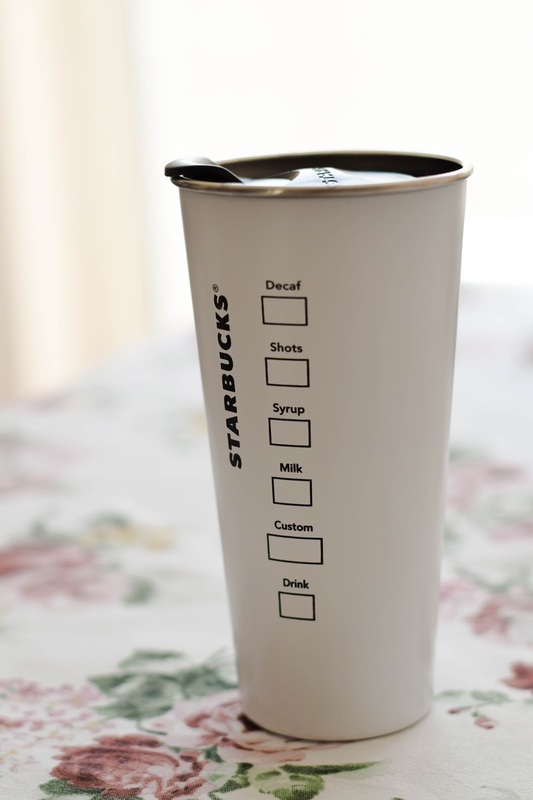 And also - it's the perfect size for a morning latte. Think that`s one of the reasons why I started drinking coffee. 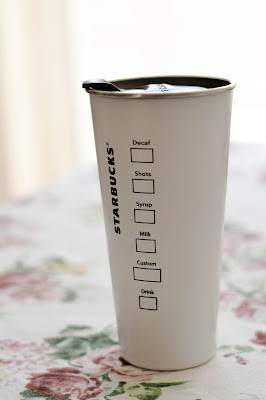 And the other one is an amazing travel mug. And yes - I friggin love it. When I saw it for the first time I just couldn`t help myself. And although I must admit that it`s not the most practical and well-made one I love it and that`s the most important thing. Makes me so happy when I can walk to uni at the morning sipping some great coffee out of a fab Starbucks mug. Ahhh... love home bits so much. Gosh, all of them are so beautiful! I'm also a candle enthusiast (there's nothing quite like lighting a candle in my when I come home from work and reading a good book). Your "Buddha head" is my favorite, though! The symbolism of it is beautiful, I wish I had one myself. 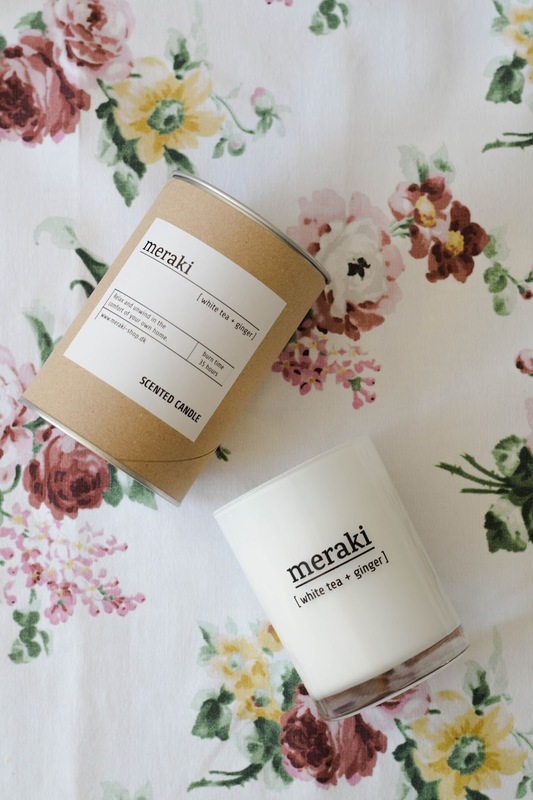 Yea, there`s nothing like creating that amazing cosiness by lighting a candle! 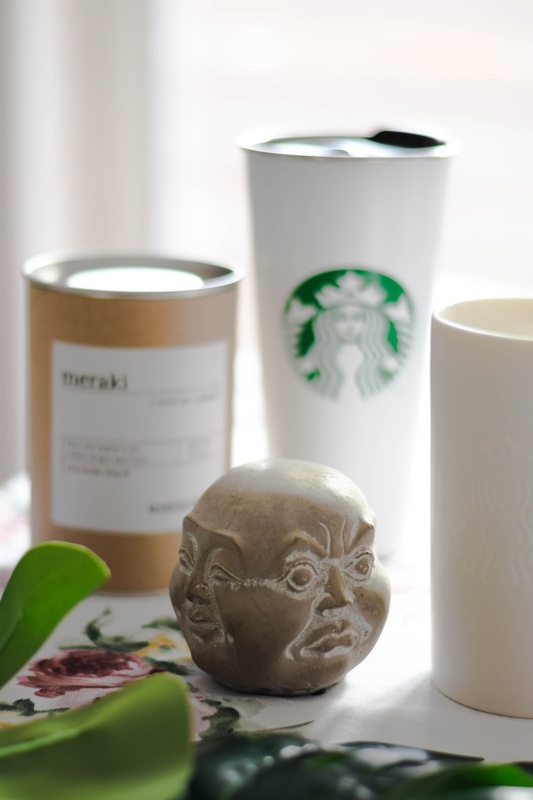 Love that little fella (the Buddha head, lol) so much! So happy you liked it too. Būtinai turėsiu omeny, jei dar kartą ten grįšiu, hahaa. Love these! I think that I'm a homeware addict too. My husband is always asking, "Where did this candle appear from? Is this a new tray? What is this new thing?" I try to pretend they magically appear. Hahaaa! I feel you so well! I just have to buy new stuff for the home, there's just too many lovely things out there and I can't do anything about it, lol.